We have lost a dear friend, her name was Wildthing (from the song "you make my heart sing"). 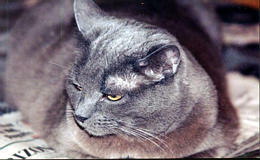 She was a beautiful grey cat who thought it was her job to love us and take care of us all the time. We miss you darling....we wish you could have stayed with us longer! !